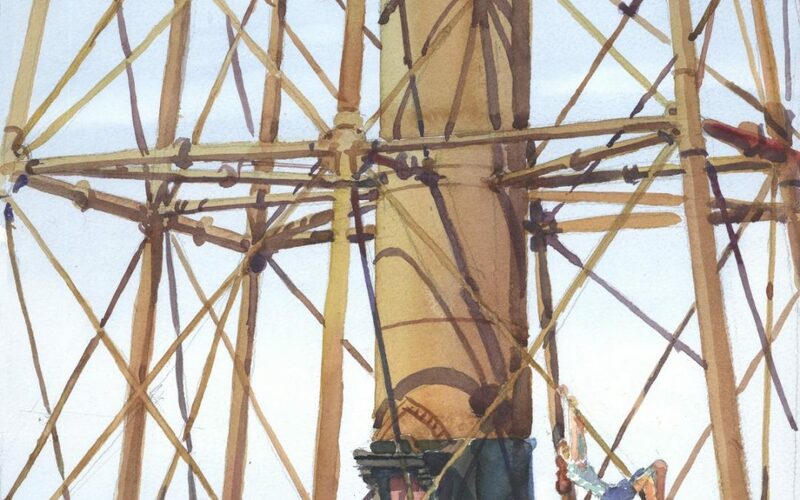 Marblehead Light, one of the Town’s historic, iconic structures, is portrayed with a focus on only the lower entry portal and the tracery of the supporting pipes and cables with their strong cast shadows. The idea was galvanized by observing two young girls climbing, dancing and hanging from the cables in acrobatic fashion. After sketching the view for the watercolor, I asked the girls if they would play on it when time came for my painting them into the composition. Their acrobatics were captured as a contrasting human accent to the linear engineering of the structure. 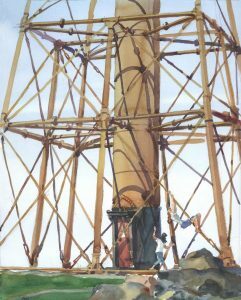 Because of Olivia & Abby’s playfulness, this piece portrays a singular moment in time of the Lighthouse and its site, Hovey Park.